We have some of the best fruit and vegetables available to us in the this country.. I can't believe how lucky we are, or how lucky I am. I am in heaven with a house full of wholesome fresh produce. The choices are amazing and we should all be embracing it. I have a bad habit of finding something I like and then having that same thing everyday for months on end. Not good.. I'm always very happy doing it but I do think I should be more adventurous. I move with the seasons.. when papapa is in season I eat it in abundance. So I suppose it's not that bad because I am eating seasonally which is the best way to eat. I always have a large salad for dinner including lots of greens with a variety of non sweet fruits such as tomatoes, zucchini etc and I also love mushrooms which are a good source of B12 for me. I have been doing a bit a sprouting lately too. Something I used to do a lot of but stopped for some time as it starting to upset my stomach. Now I have them accassionally and only in small amounts. I just love alfalfa, fenugreek, lentil, mung and pea sprouts. 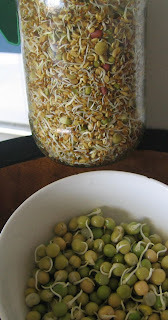 Sprouts are the ultimate Live Food!.. full of life, nutrition and sunfilled energy. It is always my treat when we go away to buy the Crunchy Combo available in the supermarkets.. Other than that I never buy them as you do run a risk of them containing mould. 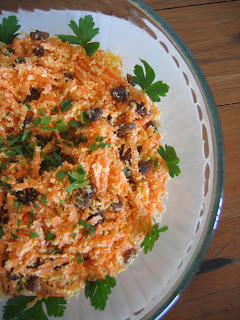 So getting back to the Salads I made up a beautiful Carrot, Sultana & Coconut salad yesterday for my daughter and her friends.. it was always a favourite of mine as a teenager and in my early 20's, I remember buying it from a little Health Food Cafe in my lunch hour. I just dress it with freshly squeezed orange and lemon juice. If you let it sit for about an hour the flavours combine and it is just a treat. 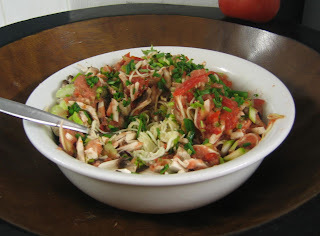 And for dinner I had a amazing Zucchini Pasta salad with finely chopped tomato, mushroom, celery and red onion with a dressing of the same with some fresh garlic, chives, ginger and basil.. it was heaven!! Followed it up with a small feast of mango's.. about 6 decent sized NT mango's.. what a great night! "I always have a large salad for dinner including lots of greens with a variety of non sweet fruits such as tomatoes, zucchini etc"
My favorite salad-like thing is made mainly of non-sweet fruits: 1 avocado, 1 red bell pepper, and 1 red tomato. I chop them up into small pieces, and I drizzle a little melted unsalted butter over everything. Sometimes I also add a few more things, like chopped pecans, chopped walnuts, flaxseed, and a little cream cheese. Delicious!